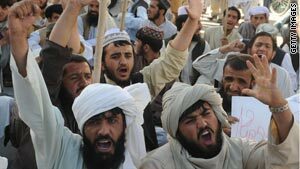 Pakistanis demonstrate during a rally against drone attacks. Washington (CNN) -- The White House has authorized an expansion of the CIA's program to attack suspected al Qaeda and Taliban operatives in Pakistan along the Pakistan-Afghanistan border with missiles shot from pilotless planes, a U.S. official confirms. The covert effort is part of the Obama administration's plan to increase the number of U.S. military forces in Afghanistan and crack down on suspected terrorists in the region. Since President Obama took office, there have been reports of more than 40 attacks by Hellfire missiles fired from drones, an increase over the approximately 30 missile strikes launched in 2008 during the Bush administration. The U.S. official took exception to reports that hundreds of civilians have been killed in the Predator attacks. The official said the strikes are "extremely precise" against terrorist targets and that only a "small fraction" of those killed have been civilians. Last May, CIA director Leon Panetta would not discuss the specifics of the air strikes, but he did say they were "very effective" and resulted in few civilian deaths.